Coming to church this afternoon as wedding commentator, I felt a bit tired. Maybe it's the Christmas novena masses (Simbang Gabi or Misa de Gallo masses) that were taking a toll on me. 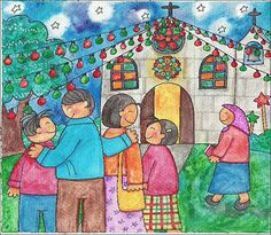 The Christmas novena masses are held three times a day for nine consecutive days until Christmas eve. There are two dawn masses at 4am and 5:30am and one evening mass at 7pm. I've been assigned three services in the dawn masses. That, plus the wedding masses. December continues to be the "marryingest" month of the year. It can be exhausting. I was still alert, although rest and sleep would probably help. The wedding today was a bit out of the ordinary. I'm familiar with one seminarian in the parish and I was surprised to see him as part of the wedding entourage. For once, he was wearing a suit and a tie. It turns out he is the brother of the groom. 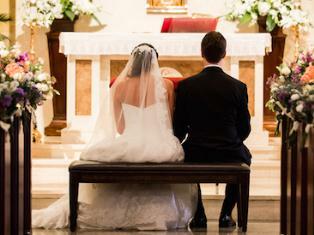 In our parish, and I suppose this is true for others, the groom sits at the right side of the bench. All the male (primary and secondary) sponsors, including Best Man then sit at the pews on the right side behind him. Same thing goes for the ladies. The bride sits at the left side of the bench and then the lady sponsors and Maid-of-Honor sit on the pews at the left side behind her. The seating arrangement is better remembered that way. I guess the mother-butler assigned today wasn't too mindful of the seating arrangements. Since the wedding couple didn't have a clue, they just sat themselves at the bench. In other words their seating was reversed. Fortunately, and for some reason, the seminarian-brother spotted this lapse. He immediately notified the mother-butler. The mother-butler in turn told the groom to exchange place with the bride. I actually noticed that beforehand but I was waiting for the mother-butler to realize the mistake and correct the seating. Had the seminarian not intervened, I would've announced it on my microphone as wedding mass commentator. After all, the wedding mass hasn't started at that point. As is common in sibling first names here, the groom and his brother-seminarian names start with the same letter. The priest had a hard time identifying and referring to them by their first names. The groom's name is Jerry. His brother the seminarian is Jeremy. They look very much like each other. As in most wedding homilies he gave his message to Jerry and his bride. Much of the message is about wishing them to have as many kids as they want and building a strong family. But he also gave a message to Jeremy, saying, "I pray I wouldn't have to see you sitting on that same bench where Jerry is seated... anywhere in the future!" Apparently, Jeremy is very close to the priests (like many seminarians) and the the priest wouldn't want him to leave his vocation at the seminary. Given the fact that, lately, vocations are dwindling, I understood what he meant. I don't know, I just found that funny after hearing it.